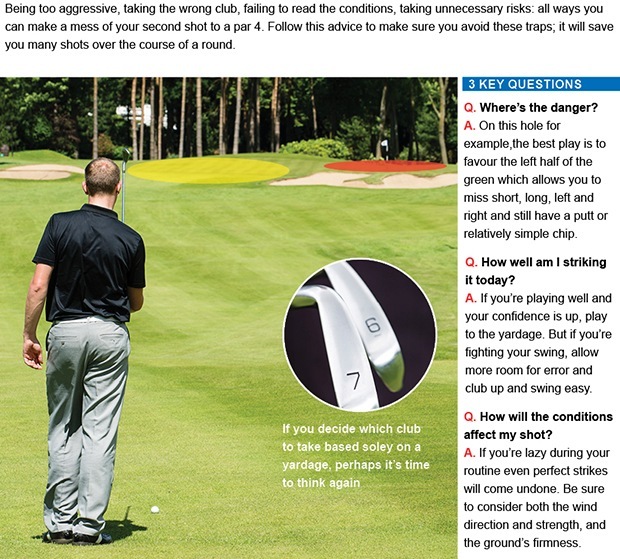 "Ideally you should have spent at least ten minutes on the range prior to teeing off so that your muscles are nice and loose, if you have rushed make sure you have a few practice swings with two clubs held together before you tee off. Also if you get a chance have a few putts on the putting green so that you are used to the pace of the greens on the day. The focus from the tee should be on the left side of the fairway well away from the out of bounds right, a good play for a lot of golfers would be a fairway wood or hybird off the tee, remmber it's a par five hole and unless you are a long hitter it will take three shots to reach the green anyway. I personally use a hybrid from the tee as accuracy is at a premium over distance and there is a pond on the right that can catch a good drive. With your second shot I would try to leave yourself a good yardage into the green for your third approach shot, sometimes you can get too close to the green, for example I would want to leave myself around 100 yards to the green for my third shot as this is a yardage I know I am confident with. The approach shot should be aimed at the middle of the green forget about aiming straight at the flag as it's a reasonably small green if you hit the centre you will never be far away from the hole, it's an uphill approach so take one more club than you may think and commit to your yardage. Remember anything right will only bounce further right off the slope right of the green but a shot to the left can sometimes come off the bank and feed closer to the green. When you finish the hole a good strategy that I always use is to just have a quick look back at the hole from behind the green and think if you could have done anything differently with how you played it this time, sometimes a look back down the hole can give you a completely fresh perspective of the hole and it's layout." 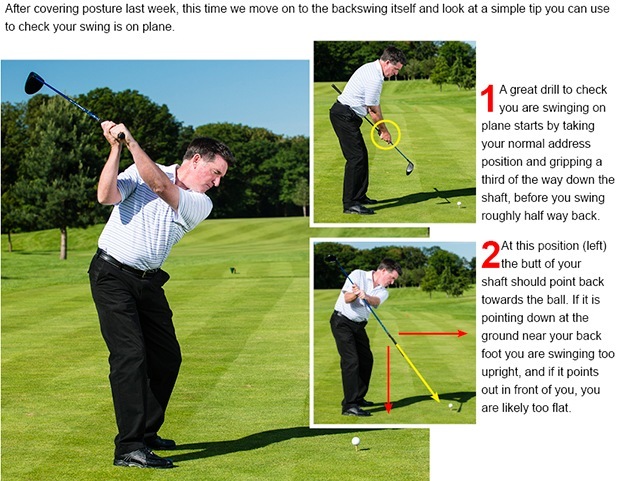 Try these tips next time you play and let me know how you get on, next week we will go through strategies to play the second hole. This week I would like to share a selection of special offers we have on golf balls, through multi buy deals you can save as much as £29!! 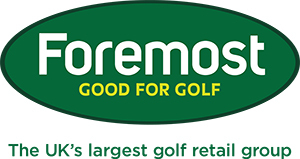 Look out soon for details of our first ball fitting day that we will be running ourselves with many models of golf ball available to try and using our Foresight GC2 launch monitor we can tell you which ball is the best for your game! Nine handicapper Martin Major blitzed around the golf course on Wednesday as he scored a 71 - nett 62, Martin hit fourteen greens in regulation as his round included two birdies and just two bogey's and one double bogey, as a result his handicap has dropped back down to eight. Martin just edged out Chris Coates who returned a nett 63 - his round included a great birdie on the difficult third hole, in third place was six handicapper James Eaton with a solid score of nett 66, James had a strorming finish playing his last seven holes in two under par. In the midweek medals Order of Merit Lee Slatford's steady play this season has earned him a five point lead over Graham Bower and Bob Bowen, there is now just one more midweek medal left this season on Wednesday 17th September. Men's captain Christopher Bird arranged his away weekend for Formby Hall Golf and Country Club whilst Ladies Captain Jill Bebbington took her ladies to Breadsall Priory in, coincindentally they both took place last weekend. So far I've not got many details on how they got on but hopefully next week I will have some results and photos to share with you. Seniors Captain Graham Bower organised his away day at our nearby sister course Pryors Hayes Golf Club, there was a great contingent of 32b seniors that made the trip across for the day and luckily the weather stayed fine for them. The winning score came from Rod Royle who scored 40 stableford points to claim the seniors Claret Jug trophy, Pete Dawson was second with 37 points and third went to Paul Frost with 35 points. Nearest the pin winners were Alan Nevin, Roger Wilkinson and Roy Strefford. Here they are pictured outside the clubhouse. The latest nine hole seniors Stableford competition was played this week, the winner was the in form Pete Dawson with a cracking score of 23 points including a birdie on the first hole for 4 points - thats always a good start to your round! In second place was Alan Calvert with 20 points and third was Bob Bowen also on 20 points, well done to Jim Fergie who scored two 2's in his round. A reminder that the seniors match away at Walton Hall has been brought forward, it's now taking place on Thursday 4th September so Graham is looking for senior golfers that wish to play in this match, if you do please let him know. For the first time at Hartford Golf Club we are hosting a shoe fitting day with Sam Allan from FootJoy, it takes place on Thursday 28th August. According to FootJoy, 70% of golfers wear the wrong size shoes and most golfers that I know have never had their foot size measured. If you have shoes where the leather has bunched, the eyelets on your laces are too close together, the heel of your shoe wears away or even if you suffer from blisters these are all signs you could well be wearing the wrong size golf shoe! As well as being uncomfortable, wearing the wrong size shoe can cause reduced stability and power loss so I would thoroughly encourage all of you to call in take advantage of this FREE measuring service FootJoy will be offering - it really could make a difference to your game. Sam will have a range of shoe styles, sizes and width fittings so there is no compromise in finding the right fit, this is really an opportunity not to be missed. You can pre-book a slot or take your chances and turn up on the day if you can make it. 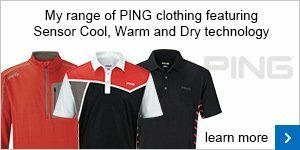 We now have another TaylorMade fitting day booked in the diary, it's coming up on Thursday 4th September from 3pm-8pm. During these times Jamie Hope from TaylorMade golf will be on hand to give you a full FREE fitting using his FlightScope launch monitor on any of the TaylorMade clubs range, whether its a set of irons, a driver or even something like a wedge. The only thing is this will be a busy day you must book an appointment in advance, please click here to book your slot. The second most fun you can have in the dark! We are pleased to announce that our famous night golf challenge is returning on Friday 5th September. This is always a great fun event and it always fills up very quickly so get your names down and £20 entry fee paid as soon as you can. The format is playing in the dark using irons only and a ball that lights up, the edge of the fairways and the greens and holes are lit up so you know where to aim, there will also be drinks in the bar from 7pm and food in the bar afterwards. You can book your place by clicking here - but be quick as we are strictly limited to maximum number of 40 players. Look out next week for further details!